Meant to write about this earlier, but it seems that NJ Transit is starting service to the Meadowlands (the big stadium in the middle of Nowhere, New Jersey, where the Giants and Jets play). Considering the stadium opened in the mid 70s, that's only a 35 year wait for fans. Well done NJ Transit!!!! Have we seen the end of Franken-first baseman? 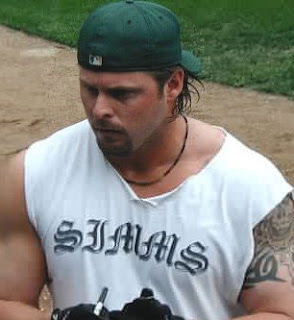 The A's cut Jason Giambi after he batted a robust .193, or 50 points lower than his weight. That is probably the end of the road for Franken-first basemen, and we here at AAPTBNL say "Toodles." Speaking of fat, here's a remarkable story coming out of the Chiefs camp. 1st round disappointment, Glenn Dorsey—who gets a clean slate this season with an entirely new coaching staff—came into camp and was "deemed too fat to practice." After riding the bike while everyone else practiced, Dorsey finally got on the playing field, but was then jumped over on the first team by 2009 3rd round pick, Alex Magee. By the way, the CBS Sportsline Rapid Report ticker is the best thing in the world. Ever. More on the Chiefs, all early reports indicate that Matt Cassell is impressing. Teammates speak of a command in the huddle—surely learned by watching Tom Brady perform for years. However, as Bill Parcells would say: "Good in shorts is one thing. Good in pads is another." So, what do you all think about the ump in the Phillies-Marlins game ejecting centerfielder Shane Victorino? Never saw anything like it, myself. My take, I think the ump overreacted a little bit. Though that said, Shane, how can you complain about balls and strikes from 300 feet away, dude? And in the AFC South, which should shape up to be one of the most interesting conferences in the NFL this season, word is that David Garrard is not having a good camp. Which doesn't bode well for head coach Jack Del Rio. It's no understatement to say Del Rio hitched his wagon to Garrard; one more disappointing season and they both might be looking for work come next February. Congrats to my Yankees—now, officially the best team in baseball—for embarrassing the hated BoSox this weekend. OK, well done guys, but don't start resting on your laurels. There are still a lot of questions heading into the home stretch—the 5th starter, Joba's innings count to name 2—so you should try to build a healthy lead against the Sox and Rays, so you can rest some people late in September. How's this for a stat: Carl Pavano, who was cut by the Indians and picked up by the Twins, started his 22nd game of the season on Saturday. He started a total of 26 for the entirety of his 4 year stay with the Yankees. 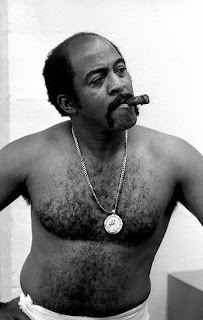 And lastly, let me just say: Love Luis Tiant. Heart his huge mustache and his wacky windup. And I'm glad that ESPN is doing a special on his return to Cuba and his life. But as anybody watching the Red Soc-Yankee game last night on ESPN could tell you; having Tiant in the booth talking for an inning and a half—and not understanding a word he said due to his impossibly thick accent—while trying to watch the actual 0-0 ball game, was just bad TV. Like I said, love the Tiant, and if you want to hear him, listen to the podcast, but putting him in the middle of an important, exciting ballgame and not having anyone actually watching or talking about the game—bad move. I agree with the whole Tiant in the booth thing last night. Would have been good between innings to keep it there and do an interview and thank him and move on for the game. I loved Tiant as a kid, the story was incredible and continues to be to this day. I have already set the DVR to record tonight's show on ESPN.